This is just a small post I'm writing to talk about my engagement ring. This is not in any way meant to show off, but I wanted a place to put pictures of it so I can share them on Pinterest and have somewhere to link back to since this first photo is going around without linking back to me. I'll go more in depth of another big reason why I decided to share this after my description of the ring. 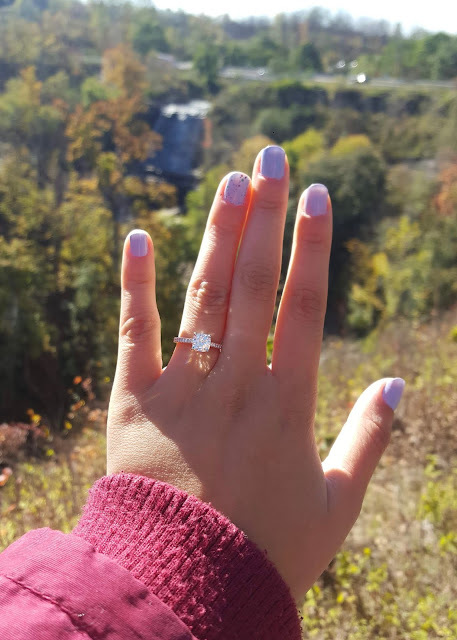 Finally, I've also gotten A LOT of questions about the ring from pretty much every single person that has seen it, so I wanted to make a post where all of the information and links are provided to make everything easily accessible. 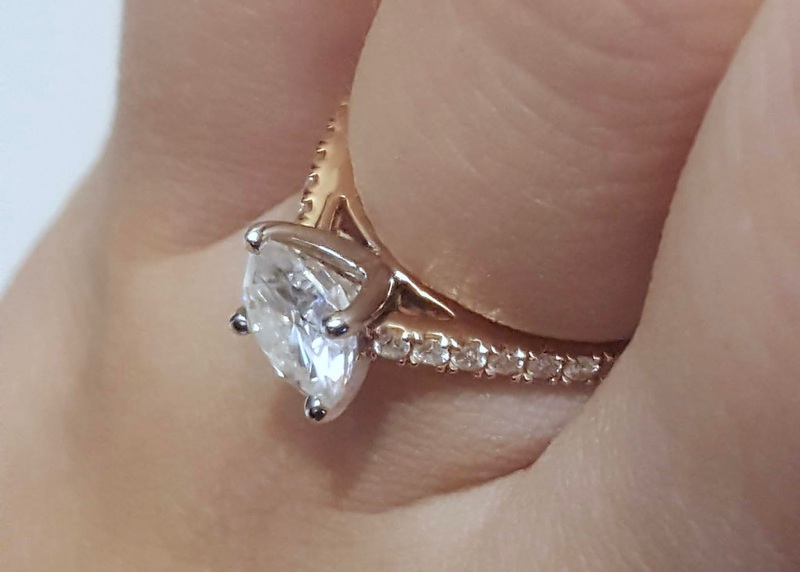 My ring setting is a 14k Rose Gold Petite Pave Cathedral engagement ring from James Allen. The website does a great job at showing you up close (360 degree view) what your ring will look like with different shaped stones as examples. My stone is a Charles & Colvard Forever One Colourless Cushion Moissanite. It's approximately 1.3ct in weight, but it measures 6.5mm wide (the same length on each side). We purchased the loose stone from Fire & Brilliance since they were having a sale that made it even more affordable and they are an official retailer so the lifetime warranty is included. We also bought the setting when it was on sale for 25% off. 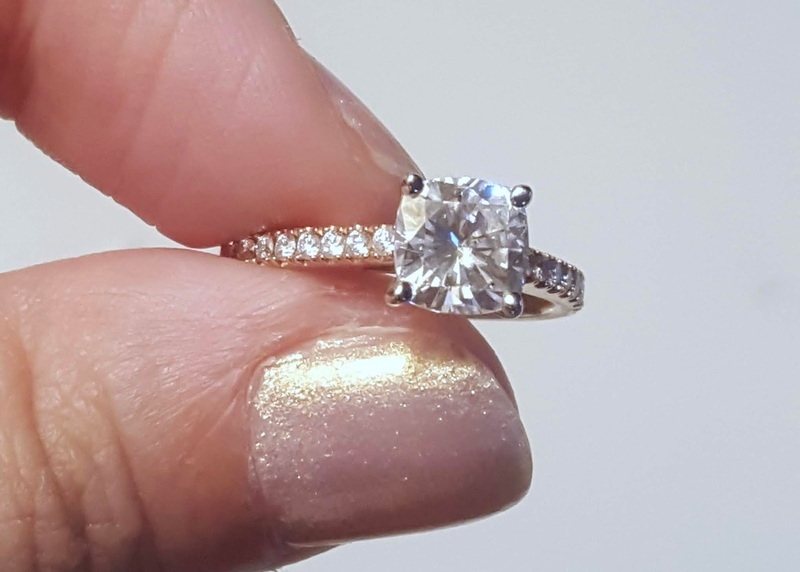 If you don't already know about moissanite, check out this FAQ page on the Charles & Colvard website. I wrote a full experience post about James Allen since getting the setting from them ended up being a huge rollercoaster ride (and not the fun type). I won't be writing about my experience with Fire & Brilliance since I can just tell you now that they're perfect! Their customer service is amazing, they have very fast shipping and they deserve all the publicity! I'm going to include a few close-up shots I took as I was writing this. 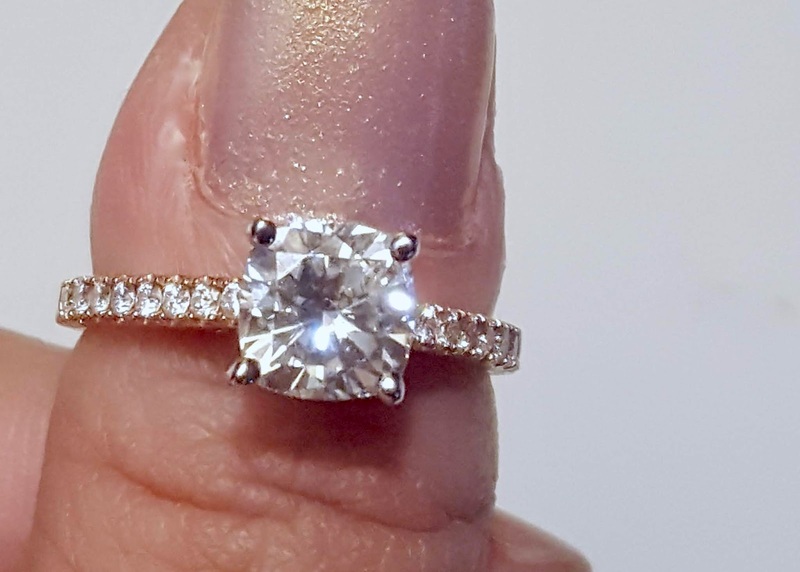 The ring was not clean at all when I took these and I was just using my side-table lamp in the basement so you won't see it sparkle as much as the outdoor photo above, but you'll be able to see the details a bit better! The last thing I wanted to show you is the ring adjuster I bought! So when I got my finger sized it was summer and about thirty degrees celcius outside. My fingers tend to swell quite a bit, so I was a size 5.5. I had it sized at two separate jewellery stores just to be extra safe. The second Steven put the ring on my finger when he proposed near the end of October I knew it was too big. It was quite cold out that day and is still very cold now that it's almost winter (fully showing thanks to Canada). 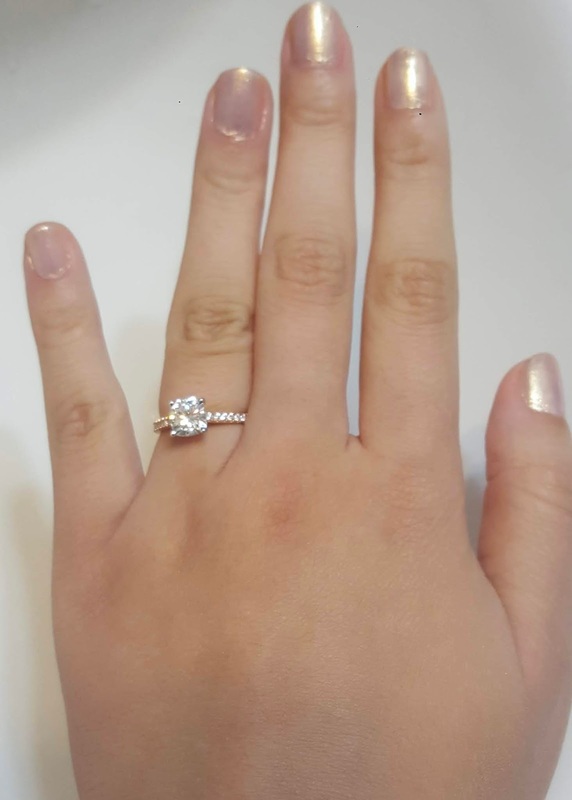 I didn't want to send the ring back to have it resized since I'm pretty sure it'll fit fine in the summer, but I also didn't want to add one of the metal sizers since they scratch up the rings. After doing a bit of research, I found this plastic sizer that has a special memory material that I can slide into my ring without people being able to notice (I'm wearing it in the photo just above this paragraph). This is the RINGO Invisible Ring Sizer and since the band of my ring is just under 2mm thick, the x-small size works perfectly. It was under $12 CAD so way cheaper than resizing or having metal balls added to the band. 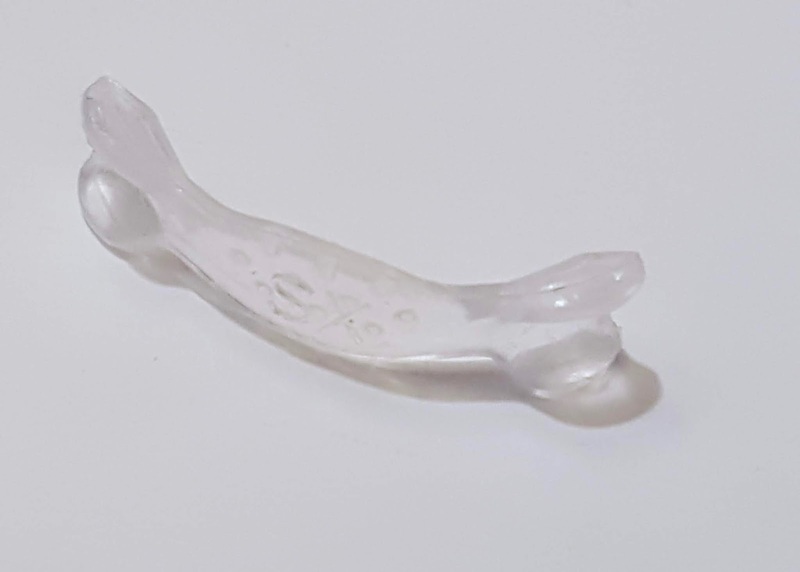 I will eventually order directly from their website so I can buy a bag of just this size, but on Amazon you can buy a multi-pack so I'll try using it for other jewellery I own. That's it for my engagement ring! I feel super weird posting this, but I know so many people wanted to know all about it and after Steven and I's experience having it made we wanted people to know more since a lot of the information I provide in my experience posts were not readily available online for Canadians. Thank you so much for the support! Please let me know if you have any jewellery cleaners you swear by (specifically for 14k gold) since I clearly need to get some. Flickable Lip Gloss Review ~ Available at The Hudson's Bay!